I am pleased to share with you that my new book, Production Planning & Control: The Beginner's Guide, is published today. This is an ebook and this ebook is currently available in PDF version. With this purchase, you will get free Excel Templates of various PPC tools and reports. Download your copy in your preferred format. You might have read articles on production planning and control (PPC) topics in this blog. I have posted many articles on production planning and control based on my work experience and observation. I have work experience in the PPC department but I never thought of writing a book on this subject. 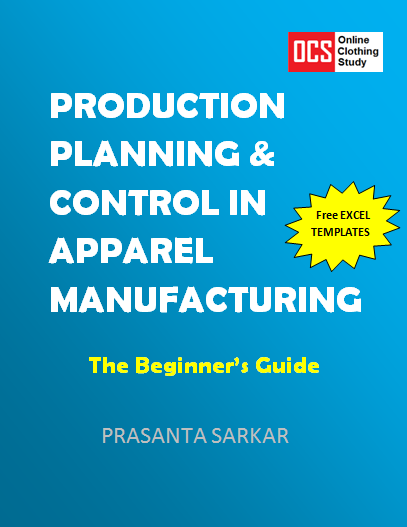 The idea of writing this ebook comes to my mind when one apparel business owner requested me for sharing a book on production planning and control related to apparel manufacturing. I had prepared a document for him covering production planning and control topics and useful tools. Later, I have converted the document into a complete book by adding more contents and PPC tools. This way the PPC book is created. Planning is the key component for the success in business. Especially in the manufacturing sector, production planning and control plays an import role meeting an organization’s goal in delivering goods on time. When it comes to garment manufacturing, as it is mostly an unorganized sector, company management does not care much about production planning part. As a result, PPC department is missing in many of the garment manufacturing companies. On the other hand, this is also true that like industrial engineering, GMT, and merchandising there are no formal courses in production planning and control. Factories don't have any place to hire a production planning graduate from. So planners learn everything related to PPC from by doing the jobs and growth. This is a knowledge and resource book in production planning and control areas. In a nutshell, in this book, I have explained production planning procedures, PPC activities, and PPC tools that I used to use in practice. I will walk you through all the relevant knowledge required in planning your production activities and controlling the plan efficiently. You might be thinking of what all things I have covered in this book. Here is the list of contents of this book. Already working in the PPC department? Enhance your knowledge. Make a purchase and learn production planning and control. In case you don't need to learn PPC, pass this information to your friends who are looking for a book and resources learning production planning in garment manufacturing. The book on Production planning and control for apparel industry professionals and apparel students. PDF version as well as Kindle version are available. This is a guide book for production planners. Number of production planning tools are explained in this book.